Global Prosperity through a Philanthropic Economy® Gabriel Media Group, Inc. Chief Executive Officer Chris Gross Chief Operating Officer Reed Bilbray Chief Technology Officer Brad Morrison Controller Yan Teng Board of Directors Michael Cunningham Chris Gross (Chairman) Dr. Josephine Gross Glenn Head Don Karn Bob Proctor Networking Times is published by Gabriel Media Group, Inc. Copyright © 2019 Gabriel Media Group, Inc. All rights reserved. Lower Your Taxes Big Time! Garrett McGrath We are all far more powerful than we believe. Don’t let the fire consume you. Become that magnificent phoenix rising from the ashes! Robert Oblon Robert started out as a graphic artist and became a meta-search pioneer and online travel expert in the early 90s. When he found network marketing, he fell in love with the business model and tried his hand at building a successful travel MLM. As a company owner, his #1 priority was to build retention in a climate of transparency. After years of trial and error, Robert now owns one of the fastest growing companies in the direct selling space. Shawn Achor & Michelle Gielan After 12 years at Harvard, Shawn Achor has become one of the world’s leading experts on happiness and how it relates to success. In his latest book, Big Potential, he shows how success and happiness are not competitive sports, but rather depend almost entirely on how well we connect and collaborate with others. To achieve our highest potential, we must transform the pursuit of happiness and success from a solitary one to an interconnected one. Dr. Yury Kronn For the past 40 years, Dr. Kronn has been studying the “subtle energy” that fills 96 percent of our universe, yet cannot be seen or measured. Modern scientists call this “dark energy,” while ancient wisdom traditions referred to it as Prana or Chi. Dr. Yury’s research and experiments show how we can use this energy to affect matter; and perhaps more importantly, that we can interact with this energy using our thoughts. Bridgette Testino Paine A 22-year-old mom, Bridgette turned to direct selling to be home with her baby while her husband was deployed. When he came home, she was able to â&#x20AC;&#x153;retireâ&#x20AC;? him from the military. Keith & Katie Yarbrough The Yarbroughs are full-time networkers based in Texas. Keith is a gifted speaker who motivates teams, while Katie excels in product knowledge and caring for others. Mark & Judy Willodson Mark and Judy were not looking for a business when they joined their direct selling company. Their product experience made them want to share with others. Brittany & Joseph Beck Living in a small town in rural Alabama, Brittany and Joseph had accumulated a lot of credit card debt. Thankfully, learning about network marketing gave them hope for a better future. Toney Freeman A competitive bodybuilder and successful personal trainer, Toney had to retire at the age of 50 due to an injury. Timing was perfect for him to shift his focus to direct selling. Lori Windham Just a few years ago, Lori’s life was ruled by the typical challenges of traditional business. Everything changed when she transitioned to direct selling. Today she has time to enjoy life. Ricky Durant Working three different jobs to make ends meet, Ricky was looking for a better way when a couple he knew shared an opportunity that in just one year would completely change his life. Les Brown - with Janine Avila Network marketing offers people a path to freedom. Part of this freedom comes from the personal development people receive from teachers like Les Brown, transforming how they think and act. Clare Holbrook Choosing happiness today and working toward your goals will help drive your business and put you on the path to personal fulfillment as a way of life. 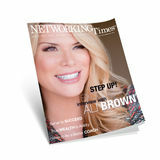 The success stories in this issue feature extraordinary leaders and do not portray the typical results of the average network marketing professional. Everyone’s results in network marketing will vary, but basically it takes consistent work to make a substantial income in this profession. Many people make little or no money at all. Earnings are dependent on—but not limited to—skills, effort, commitment, leadership capabilities, and market conditions. Common sense suggests that in most opportunities, one would find exceptional individuals performing well above average. Choosing a particular network marketing company does not guarantee any level of income or success. ridgette Paine is a 22-year-old mom who turned to direct selling to be home with her baby. She joined her company in January 2018 while her husband was deployed. One year later she has built a team that is doing more than $500,000 in monthly sales. Not only is Bridgette living the life she designed, working with people she loves; she was able to retire her husband when he came home from military deployment. Thanks to her home business, they no longer stress about bills and get to enjoy being a full-time family.—J. G.
eith and Katie Yarbrough are full-time direct selling entrepreneurs who live in Texas with their children and three dogs. Keith is a gifted speaker and has a memorable ability to motivate teams and spread encouragement. Katie excels in product knowledge and is known for her love of sharing and caring for others. Each contributing their unique gifts, Keith and Katie complement each other as a power couple in their company and the direct selling space. With a background in automotive management and nursing respectively, Keith and Katie pour a mixture of both expert knowledge and authentic passion into their business as they aim for ever higher levels of achievement.â&#x20AC;&#x201D;J. G.
healthcare management. Over the span of their two decades in direct sales, the Yarbroughs have crossed paths with many accomplished networkers and influential leaders. In March 2017, the couple aligned with Robert Oblon as they connected with his vision and mission for the company he had just launched at the time. This meeting inspired a renewed and heartfelt commitment in the Yarbroughs, as they embarked on their next journey in direct selling. obert Oblon is a multifaceted figure in the world of direct selling. He started out as a graphic artist and home-based entrepreneur who became a meta-search pioneer and online travel expert. When he found network marketing, he fell in love with the business model and tried his hand at building a successful travel MLM. As a company owner, his #1 priority was to build retention in a climate of veracity and transparency. After years of trial and error, Robert now owns one of the fastest growing direct selling companies in the world. It’s a hybrid model, combining the efficiency of online retail and the perks of the gig economy with the unique benefit of residual income. Leaving behind the stigma of MLM, he calls this next generation of direct selling super affiliate marketing—SAM. 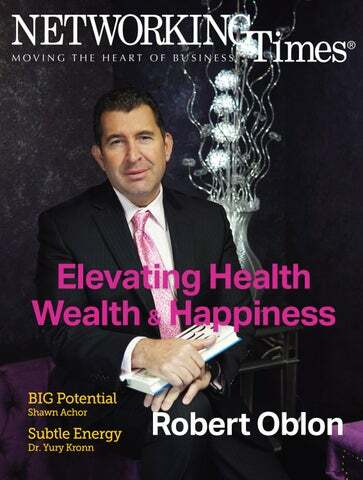 Along with his executive team, Robert made a deliberate choice to keep the product business strictly separate from the entrepreneurial opportunity, with an overarching mission to “Elevate health, wealth and happiness.”—J. G.
fter spending 12 years at Harvard University, Shawn Achor has become one of the worldâ&#x20AC;&#x2122;s leading experts on happiness and how it relates to success. His research on mindset and positivity has been featured in Harvard Business Review since 2012. His TED talk is one of the most popular of all time with almost 19 million views, and his lecture series on PBS have been viewed by millions. Shawn has worked with over one-third of the Fortune 100 companies, as well as with the NFL, the NBA, the Pentagon, and the White House. He has lectured in more than 50 countries, speaking to CEOs in China, doctors in Dubai, schoolchildren in South Africa, and farmers in Zimbabwe. His Happiness Advantage training is one of the largest and most successful positive psychology corporate training programs in the world. Shawnâ&#x20AC;&#x2122;s research has been published in a top psychology journal for work he did at UBS (a Swiss multinational investment bank and financial services company) in partnership with Yale University to transform how stress impacts the body. Shawn recently did a two-hour interview with Oprah Winfrey at her house to discuss his mission to bring positive psychology to the world. Shawn is the author of New York Times bestselling books The Happiness Advantage (2010), Before Happiness (2013), and Big Potential (2018). ark and Judy were not looking to build another business—as they are in the fifties— when they were introduced to their direct selling company. As soon as they tried the product, they wanted to share it with others. “We loved the concept of elevating lives in the areas of health, wealth, and, most importantly, happiness. How fitting was it that we could share Shawn Achor’s findings and programs on happiness, while at the same time offering products that actually helped us release happiness hormones!” The business opportunity has helped Mark and Judy create an income beyond their wildest dreams in less than six months, but they say the biggest gift is the family of business partners they have joined.—J. G.
body feels comfortable, regardless of who they are. We believe that success is simple and that if you have a great product that works, a vision, and a mission to drive your passion, all you need is the culture to build a business. Who introduced you to your business and what made you say yes? A good friend, Rich Cordle, called us to meet Robert Oblon and talk about an investment opportunity. We met for dinner in June 2017. It was a casual dinner that changed the direction of our lives forever. Next, Robert sent us a box with a “healthy coffee” to try. We drank it, it worked, and we didn’t care about food anymore! We got excited when we found out it was a direct selling company, so we became affiliates and started sharing the product. How do you build your business day to day? rittany and Joseph Beck live in Arab, a small town in North Alabama. Before finding network marketing, Brittany was an 8th-grade science teacher and Joseph worked in IT. Shackled by limited income, they had accumulated a lot of credit card debt, to the point where they were considering bankruptcy. Thankfully, learning about network marketing gave them hope. They saw a platform to get paid based on their hard work. Thinking they had found the answer to their prayers, the Becks dove all in and 6 months after joining their first company, they were debt-free. To date, they have achieved the top rank in their current company, building a multi-million dollar business in less than a year. They are now, both full-time network marketers with solid plans and lofty dreams.â&#x20AC;&#x201D;J. G.
ased in Atlanta, Toney Freeman has been a top-ranked IFBB professional bodybuilder since 2002. With over 25 years of experience in the health and fitness industry, Toney has been very successful as a personal trainer, coach, and competitor. He was first introduced to network marketing in 1996 and for two decades he experienced the typical ups and downs of building a business. After an injury in early 2016, Toney was faced with the decision whether to continue with competitive bodybuilding or retire from the sport at the early age of 50. Timing was perfect for him to shift his focus and invest in a new direct selling business. Once he realized he had found the right company with the perfect product, he and his wife Kelly started building a community of happy customers. Many have joined Toney as marketing affiliates as he is leading one of the fastest growing teams in the company.â&#x20AC;&#x201D;J. G.
the world, meet many wonderful people, and build powerful relationships. The experiences I have had and the knowledge I gained has prepared me well for the next chapter in my life. How did you find your company and what made you join direct selling? ased in Florida, Lori Windham is a single mom and successful entrepreneur who is in love with helping other people succeed. Just a few years ago, Lori’s life was ruled by the typical challenges and overhead of traditional business. Everything changed when she joined her direct selling company one year ago. Today she has time to breathe and develop herself, as well as empower others in their pursuit of health, wealth, and happiness.—J. G.
in a matter of days. I also recognized that these products were something everyone could use and afSince 2005 I had owned ford. What’s even better is a real estate and restauthey provide instant gratirant business, both of fication: when you share a which consumed my days cup of our “healthy coffee” and nights. I had very with someone, you can see little time freedom, until I their face light up within found network marketing minutes! That’s something about six years ago. I knew not many products offer. about it for many years Ultimately, I joined my but never really believed company because I felt it was an actual opportusomething special coming nity that could provide me through the people. Some with what I was looking for. Boy was I wrong! Once I got started, I got it into of them I had known from my previous years in my blood and I became addicted to it. I knew that if network marketing. People in our company have a others could make a substantial residual income in heart for others and a desire to see everyone succeed. All this is what made me take the plunge of network marketing, I could do the same. faith and jump all in! es Brown is one of the world’s most renowned motivational speakers of all time. A leading authority on achievement and peak performance for Fortune 500 CEOs, small business owners, and nonprofit or community leaders, Les Brown helps people overcome the limitations of their own mind so they can face the challenges of the world around them. Over 20 years ago, Les won a Chicago-area Emmy® for his unsurpassed fundraising pledge drive for the Public Broadcasting System. This milestone was followed by several bestselling books and hosting popular national talk shows on television and radio. Today, with thousands of followers on social media, Les Brown’s impact goes well beyond the stage and public appearances, meshing traditional and digital media to reach his global audience. succeed, and the way we achieve our freedom is by helping others reclaim theirs. Our Spring 2019 issue looks at how network marketing platforms can “elevate entrepreneurs” in the online retail and Gig Economy.